The past day or two I have been looking into making GeDoSaTo a better tool for upsampling (as opposed to its usual downsampling use case). This might seem meaningless at first, but it’s useful in a few cases. The most important such case are retro games (or modern retro-inspired indie games) which are stuck at a specific low resolution. In such cases, GeDoSaTo can be used to provide a nearest neighbour (or high-quality bicubic) upsampling, which often looks better than a straight bilinear filter. Now recently, someone integrated Timothy Lottes’ great CRT shader with GeDoSaTo. 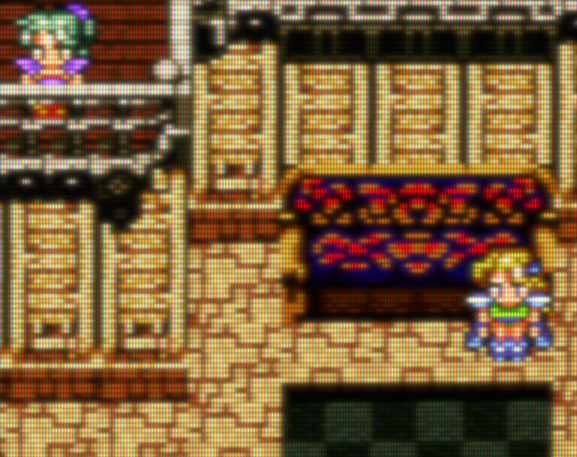 However, this only works if the shader has a sufficient number of pixels to work with. In order to support this use case, GeDoSaTo can now optionally perform postprocessing after upsampling. The resulting pattern for fixed-resolution games is this: add the fixed resolution as a rendering res in the config file, use nearest neighbour upsampling to your display resolution, and then run the CRT shader. This works well for both emulators and low-native-res 2D titles. Obviously, a lot of tweaking can be done to get the CRT to look just like you want it (sharpness of pixels/scanlines, gamma, bloom etc.). Here’s a gallery with some of my results. You can now set the timeout for on-screen messages from GeDoSaTo, or disable them completely. Settings can be reloaded on the fly just like shaders with a keybinding, but note that not all of them take effect immediately. This is mostly useful for trying out pshashes and such. More than one action can now be bound to a key/button at a time. As always, you can get the full version here or update. By the way, if the update ever fails (i.e. immediately prompts you to update again) delete the .dll and run the installer again. And also as always, if you’d like to you can donate here.